But avocado is so incredibly healthy—with its unsaturated fat, carotenoid antioxidants (like lutein and zeaxanthin), B vitamins, fiber and potassium—that I do try to work some into my food life. I experimented to perfect a balance of ingredients that would be chocolatey enough, and just sweet enough not to leave people feeling like they just had avocado puree for dessert—yet low-sugar enough for me to feel good about devouring a cup. 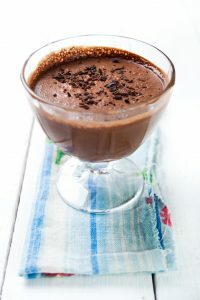 So here I wade into the fray and offer you my super-easy, richly chocolatey, creamy and decadent take on avocado-based chocolate mousse. It may not be sweet enough for everyone, but if it works for you, I think you can feel pretty virtuous eating it. I do! I like ALL my recipes to be simple, super-fast and crazy-easy…yet beautiful and delicious. This one, I think, is no exception. Blend the dates in a small food processor or blender till it’s a smooth paste. Add the avocado, cocoa powder and milk, and blend till creamy/smooth. Pour/scrape out of bowl/jar into small dessert serving bowls or ramekins.